Treat your baby boy to our beautiful 100% cotton ‘taggie’ style comforter that comes with our in house embroidery design that can be accompanied with your little Prince's name. This pretty comforter’s smooth design and texture will be adored by your little one from day one! 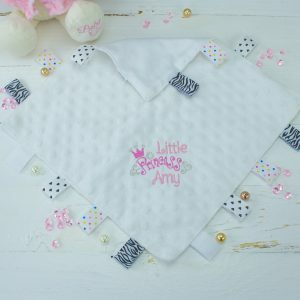 The comforter’s unique loops and tags provide the ideal soothing playground for their teeny fingers to grasp and fidget with. Both Soothing and comforting this will make your little one feel safe and soothed both day and night. 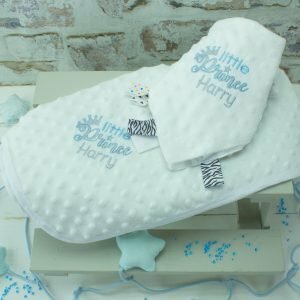 Make this cute comforter extra special with our gratis personalisation service! Treat your baby girl to our beautiful 100% cotton ‘taggie’ style comforter that comes with our in house embroidery design that can be accompanied with your little Princess' name. This pretty comforter’s smooth design and texture will be adored by your little one from day one! The comforter’s unique loops and tags provide the ideal soothing playground for their teeny fingers to grasp and fidget with. Both Soothing and comforting this will make your little one feel safe and soothed both day and night. Make this cute comforter extra special with our gratis personalisation service! Our adorable white teddy bear comforter is the perfect gift waiting to cuddle up to a newborn and sooth them all day long with its cute teddy bear design and tags for them to fiddle with all day long! Treat your baby girl to our beautiful 100% cotton ‘taggie’ style comforter available in a range of colours including soft pink and white. This pretty comforter’s smooth design and texture will be adored by your little one from day one! The comforter’s unique loops and tags provide the ideal soothing playground for their teeny fingers to grasp and fidget with. Both Soothing and comforting this will make your little one feel safe and soothed both day and night. Make this cute comforter extra special with our gratis personalisation service! 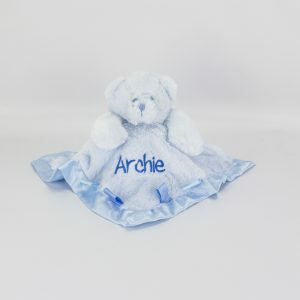 This Personalised Blue Bunny Rabbit Comforter is guaranteed to be every baby boy best friend and be on hand 24/7 to sooth him day or night. You can also make his new comforter extra special with our complementary personalisation service, just let us know his name to embroider below! Treat your baby boy to a little buddy designed to sooth them through those early years with our blue teddy bear comforter - guaranteed to steal his heart! Treat your baby boy to our beautiful 100% cotton ‘taggie’ style comforter available in a range of colours including soft pink and white. This pretty comforter’s smooth design and texture will be adored by your little one from day one! The comforter’s unique loops and tags provide the ideal soothing playground for their teeny fingers to grasp and fidget with. Both Soothing and comforting this will make your little one feel safe and soothed both day and night. Make this cute comforter extra special with our gratis personalisation service! 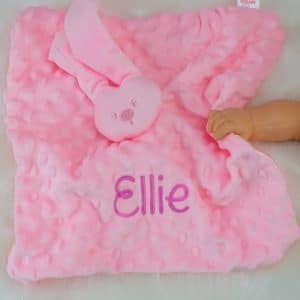 Every baby girl needs a best friend on hand 24/7 to sooth her, so look no further than our adorable pink "Teddy Comforter" a cute and practical gift that she bound to fall in love with. 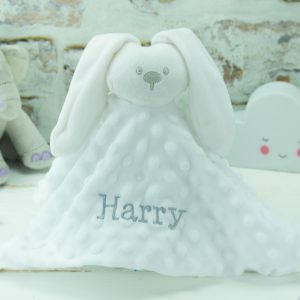 This Personalised Blue Bunny Rabbit Comforter is guaranteed to be every baby's best friend and be on hand 24/7 to sooth them day or night. 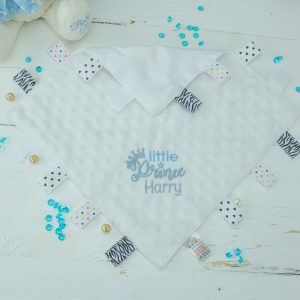 You can also make their new comforter extra special with our complementary personalisation service, just let us know baby's name to embroider below!